Once you have completed the session it will present you with a certificate. Save this certificate and e-mail it to the Girls Director at . Rules Clinic and/or Rules Q. & A. The Rules Q&A training is an in person training that is required for U11,U13 and U15 coaches, it is optional for U9 coaches. The Rules Clinic is a more comprehensive version of the Q&A that can be taken. You need to complete only 1 of the 2, not both. Register on www.mbgll.org under Individual Registrations. (Coaches must complete these courses once. This is not the same as the Level 1 Clinic which is in an in person 3 hour training. You can take this anytime, just log onto your account on the US Lacrosse site (www.uslacrosse.org), and it's under Coaches tab->Education->Online Courses, then Take a Course, Catalog button, coach courses/sessions, Level 1 courses, Level 1 | Fundamentals of Coaching Girl's Lacrosse. Once you have completed the session it will present you with a certificate. Save this certificate and e-mail it to the Girls Director at . Register at https://www.uslacrosse.org/coaches/coach-development-program/instructional-clinicswww.uslacrosse.org. Once you have completed the session it will appear in your training history at uslacrosse.org. If you receive a certificate you can scan it or take a picture of it and e-mail it to the Girls Director at . If you do not receive a certificate, please send a screen capture of your training history showing the date and completion of the course. This will be presented at Level 1 clinics and is available online at uslacrosse.org. Under Coaches tab->Education->Online Courses, then Take a Course, Catalog button, PCA Courses. There are three courses for coaches. Once you have completed the sessions they will appear in your training history at uslacrosse.org. If you receive a certificate you can e-mail it the the Girls Director at . If you do not receive a certifiate, please send a screen capture of your training history showing the date and completion of the course. 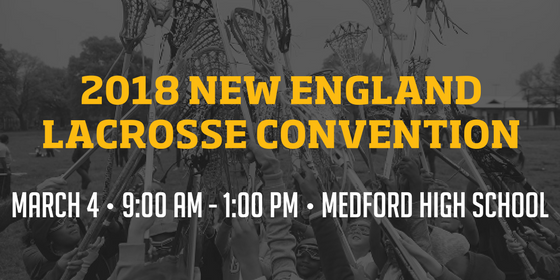 The 2018 New England Lacrosse Convention is scheduled for March 4, 2018. All coaches and officials are invited to attend. This year's Convention will include girls' youth and high school coaches and the men's umpire association. A Level 1 coaching clinic will take place after the Convention. For more information and registration, click New England Lacrosse Convention.